Home Society Human Rights ¡Fuenteovejuna, señor! Geolver Hernández. Luis Castaño. Ray Longaray. José Rafael Márquez Gamboa. Rafael Urdaneta. Luis Román. Jeferies Moreno García. Erwin Pulgar Barrios. Carlos Soto. José María Urdaneta Romero. No need to count’em – that’s 10 people. 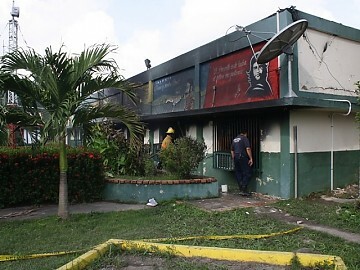 A few days ago, the local offices of the government land institute in Santa Bárbara, Zulia, mysteriously went up in flames. Quicker than you can say “Google Translate”, a hilariously-worded English language press release from the baboons working in government radio made its way to the Internet. The government quickly pinned the blame on the opposition, claiming it was a reprisal for recent government actions to take land away from its rightful owners. In what can only be described as a socialist miracle, the office’s enormous Che Guevara mural was spared the wrath of the flames. The government has detained and charged the ten individuals named above. Some stories say 12 people are involved – it’s not clear if they are discussing these 10 plus two others, or if there is another group of twelve people. Other stories mention 13 people involved. A certain Carlos Benavidez is being mentioned as the main culprit, but he is on the lam. Apologists of the dictatorship are quickly spinning this, saying the entire opposition movement is guilty. Now, I’m no Sherlock Holmes, but it stretches credibility to think that the sabotage of the small local branch of a tiny piece of the government’s vast bureaucracy … would require the work of twelve or thirteen people. Think about it – if you were planning to light fire to an office, would you invite ten of your best buddies to join you in your super-secret scheme? I mean, how hard can it be to sabotage this office? A little bit of kerosene, some handy work with the locks, a lighter, and (literally) boom. The government’s hacks better get working. Santa Bárbara has about 80,000 inhabitants. If their intent, as it appears to be, is to indict the entire town, they have 79,990 people to go. At this rate, they’ll never get the job done.